I believe strongly that one of the best life skills a person can develop is to learn how to effectively sell yourself and your ideas. Good salespeople learn and become experts in the cycle of selling. 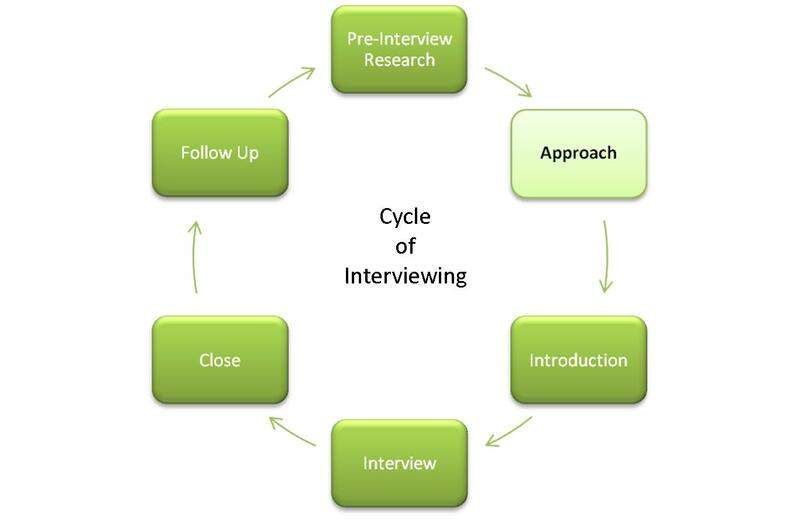 Since interviewing is selling, I’ve included this pictorial and adapted it to the cycle of interviewing to help illustrate that this process happens each time we interview. The first step is the Pre-Interview/Research which has been previously discussed and Before the Interview. This week I’d like to focus on the second step, the “Approach,” which I think is often overlooked by candidates as a critical part of the process.The approach is all about first impressions. Most interviewers will form an impression of the candidate within the first 30 seconds, so it is vitally important to be aware of this. But the first impression with the company may start as soon as you enter their parking lot or building. I’ve known of many organizations to gather feedback from a variety of sources who may have interacted with a candidate, not just the interviewer. Did a security guard or parking lot attendant talk with you as you entered the premises? Perhaps another employee watched you walk from your car to building? What will the front desk receptionist say if asked for their opinion of what they heard and observed?When you do meet the interviewer, realize that they are starting to form an opinion of you, even before anything has been said. Your posture of sitting or standing while you were waiting, grooming, dress, eye contact, and handshake are all being evaluated. Some people can blow this by trying too hard at making a good first impression that it has an unintended negative effect. This may include; arriving super early, wearing fancy clothing, over accessorizing, or even the decision to wear cologne/perfume. Successful candidates learn how to strike the right balance with their approach, so that they are relaxed and confident without projecting being too relaxed or over confident. Hopefully the above tips and suggestions will help you be more aware so you can improve your approach and interview more effectively going forward.